The Call of Cthulhu is arguably the most famous short story by horror writer H. P. Lovecraft. It is also the first story to refer to and the only piece written by Lovecraft himself to actually feature the famous Eldritch Abomination who would later name the Cthulhu Mythos as other writers took over. The story is presented as a manuscript found among the belongings of the late Francis Wayland Thurston, which is used as a narrative which joins together three short stories, each bigger, darker, bleaker, and more memorable than the last. The first part begins with a document found by Thurston among the belongings of his late granduncle Professor Angell, which describes a series of conversations with a young sculptor named Henry Wilcox, who has been experiencing a series of strange dreams on March 1st 1925, which have inspired him to carve a disturbing bas-relief. Over the course of several weeks, Wilcox and Angell meet, and the former describes his bizarre dreams in which he finds himself exploring the ruins of an unknown forgotten city. The next part reveals why this is of interest to Professor Angell. The second story tells of Inspector Legrasse, a police officer in New Orleans whose investigation of a series of disappearances leads him to a rather sinister cult worshiping a strange idol. The cultists are immediately arrested and taken to prison and the idol is confiscated. Legrasse then shares the idol among various archaeologists, including Professor Angell, hoping to gain answers as to its nature. 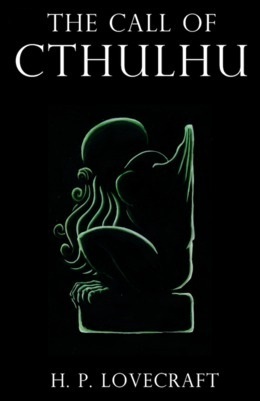 Eventually through one man's testimony and the questioning of some of the cultists, Legrasse learns that the idol is "Great Cthulhu", a being worshiped by this cult which has presumably lived for centuries. In the third and final part of the story, Thurston encounters a newspaper clipping describing the rescue of the lone survivor of the crew of Emma, a Norwegian sailor named Gustaf Johansen. Thurston is eventually able to recover a journal Johansen wrote, which tells the tale of how he and his crew commandeered the yacht Alert from a particularly sinister crew of men (implied to be cultists), and their arrival at the sunken city of R'lyeh, where Cthulhu himself is nearly released by mistake. Adapted in 2005 into a film by the HP Lovecraft Historical Society. There are also at least two radio adaptations; one by the Atlanta Radio Theater Company, and the other by Dark Adventure Radio Theatre. Dramatically read by Chilling Tales for Dark Nights . Not to be confused with the roleplaying game Call of Cthulhu, or the YouTube series Calls for Cthulhu. Or the Metallica song "Call of Ktulu" on Ride the Lightning. Above Good and Evil: Cthulhu's cultists seem to believe they will become this if the Great Old Ones return. Action Survivor: Johansen manages to escape from R'lyeh while his crewmates are unable to navigate its geometry and fall to their deaths, gets back to his ship, and rams Cthulhu himself head on. 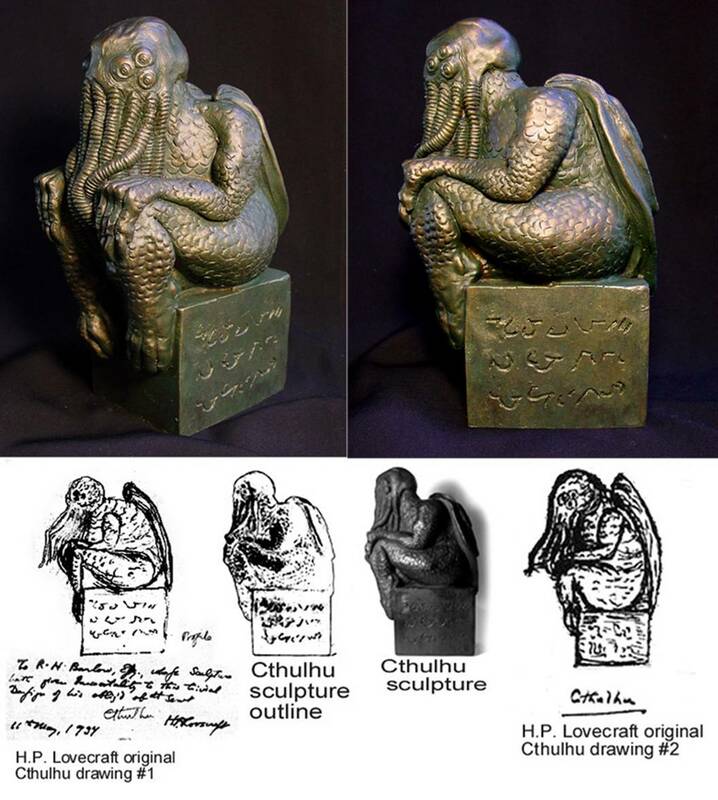 Adaptation Distillation: Lovecraft himself sketched Cthulhu in 1937 ◊ with at least six eyes. Nearly all illustrators have given it two eyes, to allow facial expressions readable by humans. So we have aggressive Cthulhus ◊, furious Cthulhus ◊, comic Cthulhus ◊, but in the author's view the entity had no understandable expression and it's completely alien. Alien Geometries: R'lyeh is said to defy any known dimensions, to the point where the sailors can't tell if a door is supposed to be a conventional door that opens horizontally, or a trapdoor that opens vertically, and a sailor is killed by Cthulhu when he fails to get past a corner which appears to be acute but acts as if it was obtuse. Anachronic Order: The three stories are presented in the order which Thurston finds them. Chronologically "The Tale of Inspector Legrasse" would actually come first, while "The Horror in Clay" and "The Madness From the Sea" happen around the same time. Apocalyptic Log: The story itself could count, since it is implied that everything that the narrator is caught up in leads to his murder by cultists. Gustaf Johansen's journal also comes close. Apocalypse Cult: The cultists apparently want to raise Cthulhu from the depths. Badass Normal: Johanssen, the only survivor of the Emma, the whaling crew that stumbled across R'lyeh and met a very horrible end. Not only was Johanssen able to retain his sanity despite facing Cthulhu himself, he managed to ram him with a ship, which disrupted him long enough for the ship to get away. He is possibly the only human to have ever encountered the dread Cthulhu and lived to tell the tale. Bizarre Alien Biology: Cthulhu is said and hinted repeatedly to lack a skeleton. It's described as slimy, flabby, jelly, bursting like a balloon, dribbling like a cloven sunfish. No resistance from a skull, a spine or any other bony structure. A mountain-sized creature can't keep shape in air without a skeleton - unless it's made from something which is not terrestrial matter at all. This is just how the cultists describe the Great Old Ones: made from something which is not flesh and not quite matter either. Black Speech: The language spoken by the cult members, which are merely adaptations of a Starfish Language into the human vocal apparatus. A repeated phrase among them is "Ph'nglui mglw'nafh Cthulhu R'lyeh wgah'nagl fhtagn." note In his house at R'lyeh, dead Cthulhu waits dreaming. Breakout Character: Considering the title character of the story had an entire mythos named after him. Breakout Villain: Cthulhu is the breakout character and a villain. Broke Your Arm Punching Out Cthulhu: Gustaf Johansen manages to survive against all odds and presumably stops Cthulhu from bringing about the end of the world. However, Cthulhu is still very much alive, and Johansen not only goes insane as a result of the experience but it is suggested that he was murdered by the same cultists that killed Professor Angell. Cosmic Horror Story: One of the original examples and possible Trope Namer. Was I tottering on the brink of cosmic horrors beyond man's power to bear? Cult: The second part of the story involves a group of police officers arresting a cult of Cthulhu while investigating a series of disappearances— victims of said cult, sacrifices made for Cthulhu. It is strongly suggested that they are behind the murders of Professor Angell, Johansen, and possibly the narrator. Determinator: Inspector Legrasse, otherwise described in the story as a very mundane man and police officer, is so impressed with the cult's monstrosity that he invests a lot of time, energy and money to discover what lies behind it. Did You Just Punch Out Cthulhu? : Johansen literally punches out Cthulhu with his ship, preventing it from ending the world though at the cost of his sanity and soon after his life. Downer Ending: The narrator finally understands what is really going on, but he also realizes that both the cult and Cthulhu himself are still alive, and realizes to his horror that he may die very soon. Ray of Hope Ending: On the other hand, Johansen survived long enough to get his story into circulation. Now humanity knows that Cthulhu can be defeated. Perhaps not permanently, and with a dear cost, but if we've done it once we can do it again. Dreaming of Things to Come: Sort of. Wilcox is influenced to create a disturbing bas-relief by a series of weird dreams. The dreams themselves don't actually predict the future, but the impact they have helps to foretell the inevitable rise of Cthulhu. Eldritch Abomination: Cthulhu himself. A, if not the, Trope Codifier. Extra Eyes: Lovecraft originally sketched Cthulhu with six eyes, but most illustrations and adaptations give him two eyes. Foregone Conclusion: When we hear the story of Johansen, we already know from the newspaper clipping found earlier that none of the other crew members will make it, though one other man survives the actual ordeal only to die of fear afterwards. The Fourth Wall Will Not Protect You: The final lines of the story involve Thurston realizing that he knows too much, and that it is very likely that he will meet his end by cultists. Then suddenly you realize you now know too much. Go Mad from the Revelation: Gustaf Johansen. The Trope Namer. His crewmate William Briden also ends up in a similar predicament, and two of his men (Rodriguez and Hawkins) outright die from seeing Cthulhu. He Knows Too Much: Thurston notices that the cult apparently makes a habit of murdering those who get too close to the truth about Cthulhu, and he expresses fear that it might also happen to him too. The fact that he is listed as dead at the beginning of the story implies that it indeed did. 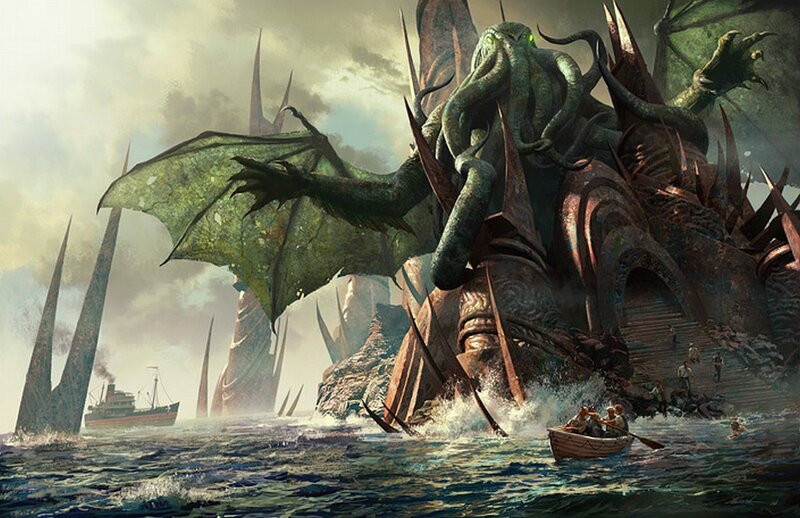 Humans Are Cthulhu: According to Old Castro, by the time the Great Old Ones awoke human beings would be very much like them, "free and wild and beyond good and evil", to the point that they'd welcome them as kindred spirits. Human Sacrifice: The cultists in Louisiana kidnapped multiple women and children to sacrifice them to Cthulhu. Island of Mystery: The island that pops up with R'lyeh on it. Karma Houdini: While a number of its members were killed or arrested by Legrasse, the cult is still at large. It's also mentioned that the coroners examining both Professor Angell and Gustaf Johansen couldn't determine a cause of death, removing any chance of convicting those responsible. Cthulhu himself is only temporarily stopped, and it is said to be inevitable that he will one day rise again. Literary Agent Hypothesis: Taken to an almost mythical extreme. The principal narrator of the story is one "Francis Wayland Thurston of Boston", but much of the narrative is simply his relating the account of his great-uncle, George Gammell Angell, who at one point acts as the literary agent for an Inspector John Raymond Legrasse, who narrates the account of a sailor and cult member named Castro, who in turn claims to have gained his knowledge from immortal cult members in China, who, arguably, received their knowledge from Cthulhu himself. The final link in the chain is you, the reader, as the intro gently reminds us that Francis Wayland Thurston is in fact the late Francis Wayland Thurston, whose account closes with the ominous suggestion that anyone who reads these documents is likely to end up dead. Octopoid Aliens: Cthulhu has a face that resembles an octopus, albeit crossed with a human skull. Posthumous Character: Professor Angell, the narrator's uncle. The narrator himself, given the manuscript was simply found among his belongings. Gustaf Johansen also turns out to be an example. Ramming Always Works: Temporarily, at least. Cthulhu regenerates seconds after being rammed by the ship, but he's definitely knocked out for the moment. Religion of Evil: The Cthulhu Cult is built up as such. Sealed Evil in a Can: Cthulhu. Shout-Out: Johansen's hair turns white after a terrifying incident at sea, much like the protagonist in Edgar Allan Poe's "A Descent into the Maelström". Johansen's Apocalyptic Log makes a clearer one, comparing Cthulhu to Polyphemus cursing the escaping Odysseus. Then it turns out Cthulhu can, in fact, swim. Sole Survivor: It's stated early on that Johansen was the only surviving crew member when the Alert was found. Not that it lasted long. Surprisingly Sudden Death: When the sailors accidentally release Cthulhu himself. Two die of fright on the spot, three more are "swept up by the flabby claws before anyone turned," and another is swallowed up by "by an angle of masonry which shouldn't have been there; an angle which was acute, but behaved as if it were obtuse." The Taming of the Grue: You can buy Cthulhu plush toys, and there's a meme with a Cthulhu carrying a bouquet of roses captioned "Cthulhu needs love too!" The video Adventures of Li'l Cthulhu, the games "The Stars Are Right", "Munchkin Cthulhu", etc. plays being driven insane by the touch of the Elder Things for laughs. There is now an entire line (several, in fact) of children's books introducing the unspeakably eldritch horrors. People are doing Dr. Seuss versions of HPL's most famous stories. Then mankind would have become as the Great Old Ones; free and wild and beyond good and evil, with laws and morals thrown aside and all men shouting and killing and revelling in joy. Then the liberated Old Ones would teach them new ways to shout and kill and revel and enjoy themselves, and all the earth would flame with a holocaust of ecstasy and freedom. The Unpronounceable: "Cthulhu" is an approximation of an alien language, that humanity lacks the necessary body components to pronounce. Would Hurt a Child: The cultists in Louisiana sacrificed the children they kidnapped. You Are in Command Now: After Captain Collins and First Mate Green, die fighting the crew of the Alert, Johansen is promoted to leader. Composite Character: Thurston plays the role in the story originally played by Gustaf Johansen. Gender Flip: Castro. The nickname is changed from "Old Castro" to "Mother Castro". Adaptation Expansion: This version adds a Framing Device about two police officers who investigate Thurston's death.